Weston Products Vertical Sausage Stuffer from One Stop Jerky Shop will last a long time and they are easy to use and clean. Making sausage in a Vertical Stuffer is fun for the whole family. 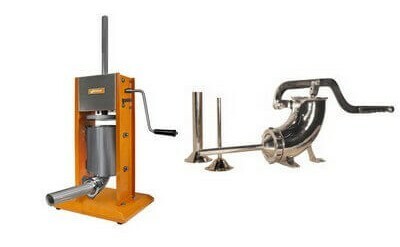 Comes with various sizes of stuffing tubes for different sizes of sausage casing. The Chop-Rite #25 4 quart cast iron sausage stuffer is made by one of the oldest names in the industry, Enterprise Manufacturing now known as Chop-Rite Two. This manual stuffer holds approximately 8 lbs. of meat and quickly disassembles for easy cleaning. Makes sausage stuffing a breeze. Comes with ..